The hip-hop musician will preview his new record in an art space alongside projections by VHS artist Uzi. Art and music will intersect in a new show to celebrate the release of Wiz Khalifa's forthcoming album, Blacc Hollywood. 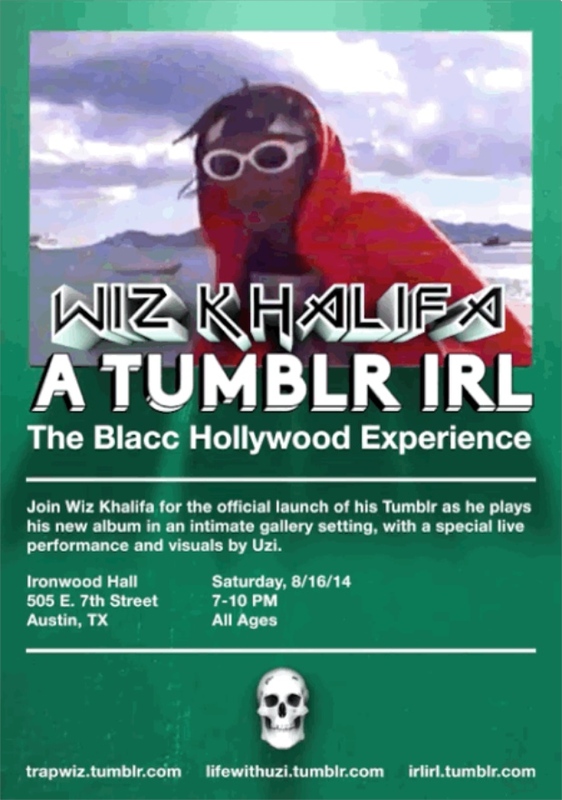 The hip-hop artist is partnering with Tumblr IRL for a free live exhibit to be held at Ironwood Hall in Austin, Texas on August 16th, three days before the official release of his new record. Titled The Blacc Hollywood Experience, the album listening party will be presented in an space surrounded by lo-fi VHS artist Uzi's projections, along with Khalifa himself performing several songs from the album. "Wiz Khalifa has had a growing, passionate fanbase on Tumblr for years,” Tumblr's Nate Auerbach said in a press release. “Through UZI's art, Wiz has added a visual element to Blacc Hollywood that illustrates his music in a way unique to Tumblr and that this audience can truly grasp. I can't wait to take this to a town like Austin and invite fans inside his album in real life." For more, listen to "True Colors," Khalifa's duet with our current cover star Nicki Minaj from Blacc Hollywood.